Do you want to know why to buy Asus Google Nexus 7 Tablet? Read out the article and know about Nexus 7, being worth buying in every aspect. Also get informed with the price, availability and package contents of Google Nexus 7 Tablet. The launching date of Nexus 7 in India was between 8 and 9th November 2012 and by then, Google became popular all over the world. 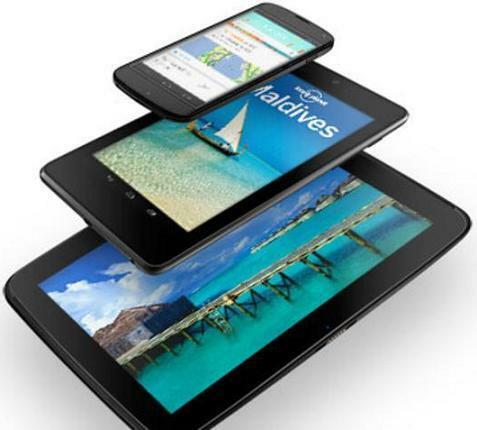 With the jaw dropping price tags of Rs 15,999 for 16 GB Model, Rs 18,999 for 32 GB Model and Rs 21,999 for 64 GB Model, Asus Google Nexus 7 got highlighted in Hands on reviews. Read about every aspect of Nexus 7 now and Why to buy Asus Google Nexus 7? let's discuss. Nexus 7 is a pocket-sized and powerful tablet. At 12 oz (340g) only, Nexus 7 with 7" display is the lightest ever tablet. The tablet, also known as the no compromise Android Tablet comes with the latest Android version OS, stunning quad-core technology. Though light enough, Nexus 7 has a battery life of 10 hours (web surfing) and 300 hours (stand-by-time). This aspect assumes its worth buying. Nexus 7 users don't rely on calling and chatting only but they also mess with many awesome apps and games with their fingertips. There are about 0.7m (700,000) apps and games for Nexus 7. You can easily download them on your device through Google play or Web. Don't forget the internal memory of the tablet i.e. 16 GB (minimum) which is pretty good for download 100s of apps and games for your Smart device. Also with the top quad-core performance and many sensors like accelerometer and gyroscope makes Nexus 7, a high-end tablet for entertainment. You can roll, tilt and tap the device anywhere, anytime. Designed for gaming, Nexus 7 is to be bought. Yes! Asus Google Nexus 7 has a 7" HD display Back-lit IPS display with a resolution of 1280x800 pixels (216 ppi). But this isn't all. The screen of Nexus 7 also comes with Scratch-resistant Corning Gorilla Glass. Now you don't need to replace the lamination (screen guard) of your tablet every time. If anyone is buying Nexus 7, I tell you, he/she has chosen one among the best tablets. Nexus 7 holds plenty of A-class apps of Google, like Gmail, Google+, YouTube and Chrome and you can have an access to them only just by tapping. Though these apps work online but you don't need to worry as Google Nexus 7 supports wireless Wi-Fi 802.11 b/g/n internet service. The tablet also offers its user, tons of free cloud storage which, one can find nowhere else, other than Nexus 7. This aspect is quite pointing towards worth buying of Asus Google Nexus 7. Asus Google Nexus7 is fully loaded with many awesome sensors including Microphone, NFC (Android Beam), Accelerometer, GPS, Magnetometer and Gyroscope. There is also a magnificent battery of 4325 mAh which provides a backup of 8 hours on active use. You have got the better choices of buying it. With all these features, Asus Google Nexus 7 is meant to be expensive but is available at an affordable price of Rs 15,999 (16K) only. You can easily buy Nexus 7 from Google Play Store and many other online shopping websites like Amazon. The package contents of Asus Google Nexus 7 include Nexus 7 tablet, USB cable for sync/charging, Dual-voltage USB for wall charging and a user guide for a quick start. Google Nexus 7, with a built-in design of gaming and entertainment, is indeed recommended to buy. And with the NVIDIA Tegra 3 quad-core processor, Nexus 7 is meant for Google Play. No matter what others say, but I say, Google Nexus 7 is a modern, high-tech and high-end tablet, available at an affordable price of Rs 15,999 only.